Topics: Conditions Reports, and Shop. On average 1.50 pages are viewed each, by the estimated 68 daily visitors. 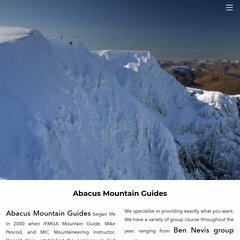 Abacusmountaineering.com's server IP number is 213.171.219.4. ns1.livedns.co.uk, and ns2.livedns.co.uk are its DNS Nameservers. It is hosted by Fasthosts Internet Limited - Uk S Largest Web Hosting Company (England, Gloucester,) using Microsoft-IIS/6 web server. A time of 131 ms is recorded in a ping test, also its average full page load time is 180 milliseconds. This is slower than 99% of measured websites.